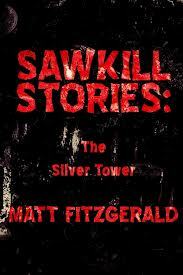 This review includes Sawkill, The Silver Tower and Cora. The Silver Tower and Cora are both short, standalone books. The main character, Jessie, is working away from home and he misses calls from his wife Mauri. Jessie is 300 miles away in New Jersey from his wife in Massachusetts. It transpires that an infection has started in Manhattan and during the 9 hours that Jessie has had his phone turned off, events have escalated. The virus hasn’t been contained and the system has completely broken down. Jessie needs to get back to his wife and kids, and there are hordes of zombies in the way, not to mention the US government wanting to cleanse te infected areas by dropping bombs… not an easy trip then? I found myself not really liking Jessie. He’s some sort of Jason Bourne type character who seems perfectly at ease in killing anyone that gets in his way. He’s supposed to be the good guy in the book but acts more like the bad guy. I guess the writer is trying to show that he’s a guy that stepped up when needed, but he comes across as a bit of a sociopath. Anyway, I won’t give any spoilers, which I’m sorry kind of leaves a shorter review. It’s certainly a rollercoaster of action, some of which sometimes seems a little convenient, but it is a page turner. If you like a fast-paced action kind of book, this could be for you. Cora is a more like a taster than a short story. It’s a about a man and his daughter. Again standalone but not too bad. All in all, not a bad set of books. They are quite often on Amazon Prime, so well worth a read. Watch out for a few typos though. I also think there is a new book coming out.